Fresh hummus with high style at this Capitol Hill restaurant. 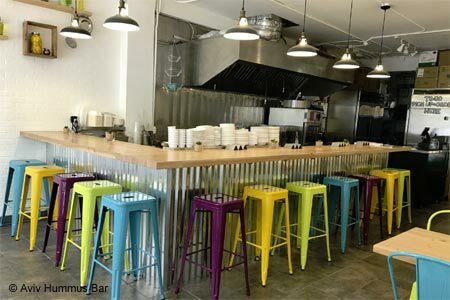 About the restaurant & décor: “Hummus where the heart is,” a wall mural greets customers as they enter the L-shaped restaurant, and it only gets more adorable from there, with a rainbow of brightly colored chairs and stools pulled up to blonde-wood tables and the chef’s counter. The service matches the décor in liveliness, greeting customers and chatting from the open kitchen. Likes: Friendly service, fluffy pita. Dislikes: Small drinks menu, no parking. Food & Drinks: The short menu offers a half-dozen items, all but one of which features the star of the show, the hummus. Made fresh daily --- and sometimes to order --- it arrives whipped and warm, a far cry from the dense muck of supermarket tubs. Thick, soft pita that comes with it also holds falafel in the sixth entrée, but either the fried chickpea balls or the bread can be ordered separately as a side, along with fries, salad and more of the pickles that come with each dish. The downside to the simplicity of the menu is a lack of dessert selections and limited drinks (house wine and a few beer bottle options).